Check out the many reasons to enjoy this excellent source of protein. Then see the links below for tasty recipes! Eggs are low in calories. One large egg has just 70 calories. Eggs are high in quality protein – they have all 9 essential amino acids. One large egg has 6 g of protein – about 12% of our daily needs! Eggs are NOT high in artery-clogging saturated fat. One egg has 5 g of total fat, of which 1.5g is saturated. Eggs are great for our eyes – they have lutein and zeaxanthin, carotenoids. These fight-to-chemicals prevent eye disease, known as macular degeneration later in life. Eggs are one of the few foods with naturally-occurring vitamin D. One egg contains 41 IUs – about 10% of our daily needs! Vitamin D is required for calcium absorption, bone growth regulation, cell growth, neuromuscular function, immune function and may help to reduce inflammation. 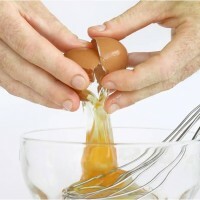 Eggs are rich in sulfur, which helps maintain strong nails and hair. Other foods rich in sulfur are broccoli, asparagus, onions, garlic, and flaxseeds. Eggs are a good source of choline, which is important for muscles and memory. It’s also critical for healthy fetal brain development as it aids in stem cell proliferation and apoptosis and closure of the neural tube in a developing fetus. Eggs are easy to make and there are dozens of healthy ways to prepare them! Eggs can hold us over between meals because they are full of protein. Protein gives us that full feeling. Eggs are relatively inexpensive, especially in comparison to other high-quality proteins, such as red meat. Each egg costs only about $0.15. Read more on Super Foods! Recipe: Green Eggs and Ham – Honoring Dr. Seuss!